*Note – painting are sent in a roll. This is a recreation of a piece which was already sold. The recreation is 100% hand painted by Dmitry Spiros using oil paint, canvas and palette knife. Its not an identical copy , its a recreation of an old subject. This recreation will have texture unique just to this painting, a fingerprint that can never be repeated. My recreation will look similar but will have different texture, each knife stroke is unique and impossible to repeat. Each painting I create is one of a kind. Signed by the artist, Certificate of Authenticity with the value provided. Sending pictures within 5 business days after payment. 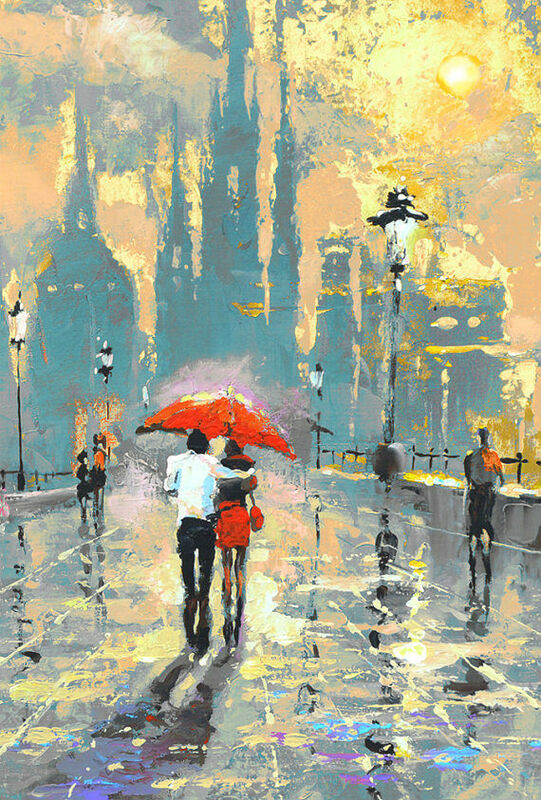 I'm an artist Dmitry Spiros. Inspiration and Love lays of each my paintings.God gave me the opportunity to draw pictures. I'm happy being able to draw pictures. was born in Tashkent, November 11, 1971, in one of the former USSR republics. currently resides in the popular resort city of Cancun, Quintana Roo, Mexico. The subjects of my paintings are mostly city scenes, genre paintings, the sea, flowers, and portraits. Most of paintings are created using the medium of the palette knife, oils, and acrylic paint.